The following article was penned in 2000 from his Kinbrace Station home by the late Keith Tyler, one-time Secretary of the Friends of the Far North Line. He was also much involved with the Stanier 8F Locomotive Society, holding a number of posts and for several years being Editor of that society's magazine, Black Eight. The article is reproduced from issue 109 (published in 2001) by kind permission of the current Editor of Black Eight, Rob Newman. "Kinbrace Calling. S8F Stoke Prior, Are You Receiving Me? Over." Winter in the Far North is not without its moments, and your Secretarial Office has done itself few favours by attempting to keep a discreetly low profile. It started innocently enough. Just a few inches of snow before Christmas and two days of brilliant sun with - exceptionally - no wind offered a delightful greetings card prospect from the warmth of the house. Frost and snow sparkled from every twig. It was wonderfully quiet. It may be worth mentioning that this tiny village boasts only a primary school and no pub. For years there was a small but very useful general shop. About a year after my arrival it closed. (Soon after this the main hotel in Helmsdale also closed, and a friend in Orkney implied I was not having a very good effect on the local economy . . . we are still speaking, but only through our shared solicitor.) My nearest shops are now in Helmsdale, 17 miles; following closures there and in Brora (is my malign influence still at work?) my nearest fresh meat butcher is in Golspie, 33 miles; the alternative, and for A3 photocopying, is Thurso, 37 miles. One might argue that in a sense Kinbrace is a commercial hub, but the spokes are unquestionably pretty long. It is also the case that standing about genially waving a cheque book in the hope of getting something done cuts very little ice north of Inverness. Steadfast patience and enjoying the peace is all. On 6 February I took the morning train to Thurso, expecting to be back at lunchtime. This was probably unwise - it was snowing and the wind rising - but I relished the sense of adventure as we ploughed through quite a few snowdrifts, the impact slightly reducing our momentum, and felt sure, having got me there, they would get me back. Shopping and copying done, I awaited the returning unit. As soon as it arrived the crew informed us we would be waiting four hours, a snowplough having set off from Inverness ahead of the midday train. At about half-time they advised this would be extended another hour or so, as the plough had hit something at Lairg and was being repaired: meanwhile the northbound midday train, running late, was held at Ardgay. To wile away the time and as it seemed we would become the last southbound working, we took a return trip to Wick to see if any intending customers showed. Both ways we ran through a snowdrift near Watten. Soon after this the crew on the plough, having finally got through to Georgemas, declared the line unfit for use due to drifting. Our crew, having exhausted the catering trolley, sent for fish and chips all round while arranging overnight accommodation. Once we were safely installed - it was snowing and blowing hard - the replacement crew set off for Wick, so the unit might be ready for the next day (or the day after that) and sadly got stuck in the snowdrift between Georgemas and Watten. Meanwhile - relayed to us by our own crew in the hotel - the delayed midday train had struggled almost to Kinbrace and got firmly stuck after several attempts to extricate themselves by toing-and-froing. It was by now dark, the train was about 600 yards from the road, which was blocked, and they were running low on fuel. 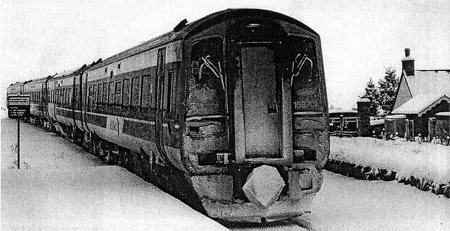 It was some hours before the snowplough cleared the road from Helmsdale and a tracked vehicle from a nearby estate could reach the train and rescue the 18 passengers and crew, who were welcomed and put up in a hotel in Helmsdale after midnight. It transpired customers had been warned from the outset by ScotRail that they were travelling at their own risk due to the worsening weather conditions. This no doubt seemed a shade timid in Inverness, Dingwall or even Ardgay. But never let it be said ScotRail understate their case. The stranded unit was only just out of sight of Kinbrace, half a mile away, but I was not here to assist in the rescue, or even to photograph it next day. I can only apologise. Next day we were advised to take the coach south, via Wick as the direct road was snowbound; as it was, there were five foot drifts in Georgemas and barely room for traffic. This got me to Helmsdale, but the road up the valley was again blocked, so I was obliged to spend another night there and wait until late next day to get home. I had been a refugee for 2 days. I have learned one lesson. Never go shopping in winter in the Highlands without taking a good book, a change of clothes and a razor . . .
On 1 March the committee of the Friends of the Far North Line met in my house, duly arriving by train. This too proved ill-advised so early in the year. We had had about eight inches of snow but I had cleared the platform edge and a path to the door the previous day. By lunchtime it was snowing quite heavily, and during the afternoon we were surprised by an unscheduled southbound train running through. On enquiry by the platform phone (an excellent device for information from Inverness - when it's working!) we found this was the midday northbound returning in extremis to Helmsdale to put its passengers on the bus, as a freight had suffered mechanical failure further north and blocked the line. We presently discovered the unit that had passed was being held in Helmsdale to run as the last southbound working. Meanwhile the road from Helmsdale was deemed impassable. It began to look as though I would have six unwilling overnight boarders, for whom I had insufficient beds. Another lesson learned: in winter always have a Contingency Plan. After much telecommunication I prevailed on the Roads Dept. to cut short their tea-break - they were not due out until evening - and plough the road for us, while a very kind neighbour who has a 4x4 undertook to get my guests to Helmsdale. He did, and they duly caught their train, which was held for them, but they reported it was an unpleasant and rather hazardous journey. Three weeks later we had another Incident. First Engineering, Railtrack's maintenance contractors, have some bimodal vehicles fitted with flanged wheels as well as normal tyres. A heavy one of these, doing some work in a location naturally difficult of access (and thus giving my Law of Universal Cussedness a real chance to show its mettle), became unstable and tipped over the embankment, and for two days resisted all attempts to lever it up and re-rail it. Fortunately no one was hurt, but we now have a severe speed restriction until the bank can be reinforced. So while this fairly remote part of the country may well appear a haven of laid-back tranquillity, where mañana is considered far too hasty a word for everyday affairs - and believe me we have those too -do not be too easily deceived.